How To Stop & Find Out Private / Unknown / Withheld Numbers Calls? Are you being harassed with continuous phone calls from withheld / unknown / private numbers missing Caller ID? As much as this seems like a super-cool & fun activity for those on the other side of the line (for example: your secret admirer, ex boyfriend, girlfriend or partner, colleagues or friends from school pooling a prank on you etc. ), it is definitely not a fun ride from the victim’s point of view (ahem, you!). In some countries, depending on severity of the situation, a caller who disturbs another person may end up in prison for up to several years! Is there a way to find out who is constantly upsetting you? Is there a way to find out number from which the other person (or a programmed bot) is calling you? Why is it hard to find out hidden / withheld / private number? First of all, we are not talking about illegal and immoral channels here; we do not assume any special connections with government agencies and corrupted individuals; broken SS7 protocols and how all modern mobile telecommunications are easy to spy upon and thus, when privacy is at least a concern, technically broken. Again, local / regional laws and legalities dictate how telecom providers behave in case of certain services. By law, in some countries, providers are required to provide calling line identification restriction (CLIR) to all their subscribers. 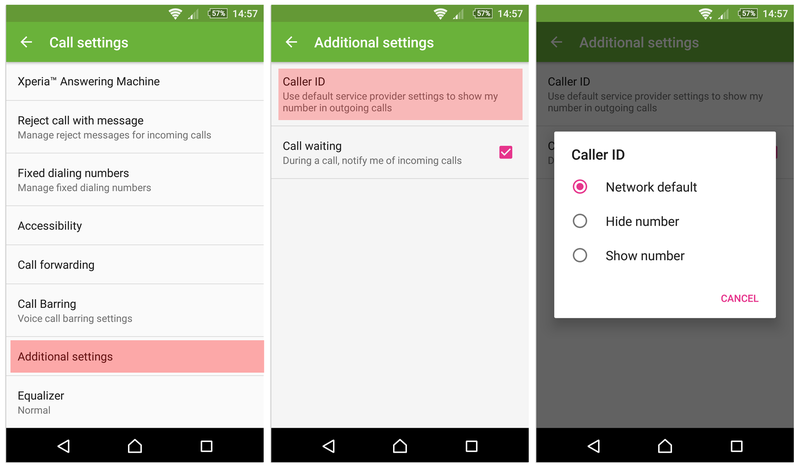 In layman terms, this means that caller ID hiding / withholding is allowed to anyone who activates such an option in their phone or service (see below screenshot where to find Caller ID settings in Android). 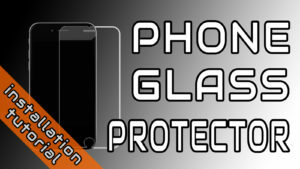 A practical example to justify this option: suppose you wish to get informed about some product or a service from a company X, but you do not wish to reveal your phone number to them, so you activate the temporary phone hiding feature on your phone. Some companies have (or had in the past) a bad practice to automatically subscribe all potential clients to their phone marketing and information gathering (phone surveys or telemarketing) services, without prior explicit consent. So, in this case this kind of makes sense, right? In some countries (USA, UK, Canada, India, Australia, Singapore …) this is now regulated by so-called do-not-call-list or do-not-call-registry, so you don’t have to precise this for every company individually. All you have to do is register your number in the national list that will legally and obligatory prevent telemarketers from ever calling you with their offers and surveys. 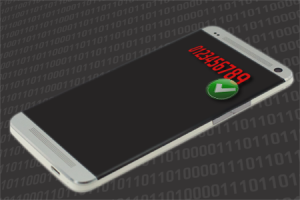 As a counter-measure, in some countries / regions and according to the local regulations, telecom operators are required to also allow a counter service to either block or reveal hidden numbers (restricted caller IDs) calls. 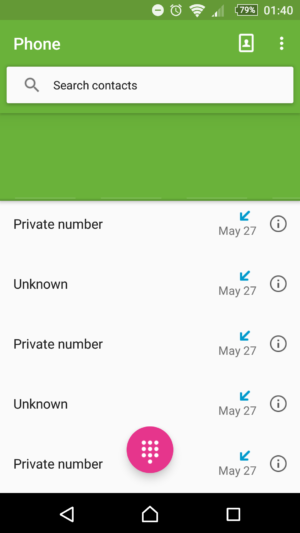 How To Find Out Secret / Hidden / Withheld / Unknown / Private Number? You first report calls to your landline or mobile cell/phone operator (usually telecom company or virtual service provider). How to do this, again, depends on local laws and service provider’s policy. Usually, you should make a call to their tech support staff, or make a visit to their nearest physical store / representative location and provide proof of intrusive calls from your phone’s call log. Once you’ve filed an official report, telecom company will take it from there. They will monitor your calls and act accordingly. If the calls continue, the caller will receive a warning. If the calls continue, the number will be terminated for good. In severe cases, where, for example, you receive life threatening or other disturbing calls & messages, you need to involve police and legal entities in your country or province. From there, everything depends on many factors: local laws, service efficiency, particular case priority / urgency, etc. For example, every country in the world has different laws, which greatly affect the entire investigation and identification process. For example, EU (European Union) and US (United States) are constituted from many individual countries with many common, and also many different / separate laws. You should get informed by visiting your respectful country’s government website(s) and telecom policies regarding this issue. Some companies require that connection must be established in case of private / unknown / withheld callers, in order to file an official report. If the number just rings you (before you have a chance to answer the call), this might be tricky. However, thanks to smart phones these days, you may automatically set answering to the calls, and bust the offender. In general, according to privacy protection act, there is no simple way to discover unknown number or identify ‘silent’ caller, unless a legal entity makes a verdict that telecom company must disclose that number to another person (you!). If you receive calls from unwanted person, you should be aware of the fact that recording those calls (conversations) may not be valid in court, simply because the other person must be notified about recording upfront and give you explicit consent to be recorded. In some cases, if you obtain a witness (3rd person) and record conversation with her/him, the recording(s) may be valid. It all depends on your local laws, really, so better get informed (in another words, you should become a self-taught @ home lawyer). On a side note, Google has removed official API support for phone calls recording since Android 6.0 Marshmallow, and completely blocked / removed this feature (even using 3rd party apps) in Android 9.0 Pie, with rationale that those features can be abused to manipulate the recorded data and that you must have explicit consent from both parties in order to facilitate call recording service. One rumor included special beeping tone during all recorded calls that will regularly indicate to the participants that the current ongoing phone call is being recorded. You’ll need a rooted phone or, alternatively, activated speakerphone and use another phone or a dedicated recording device to capture ongoing phone calls from now on, unless Google changes this decision in the future. Finally, there are some 3rd party services, such as TrapCall, that claim they can unmask and reveal to you any Private / Unknown / Withheld number at any time. All you have to do is sign-up for their service, then reject or decline the call from an unknown number, wait couple of seconds and your phone will ring again with the caller’s phone number revealed. They work on a principle of unanswering or declining/rejecting withheld/unknown/private callers and forwarding them to TrapCall’s special phone number. Of course, you need to set-up (conditional) call forwarding in your phone, which is done automatically by their app or by your telecom service provider in special cases. So, how TrapCall service works? We assume that their ‘special number’ has a feature of unmasking caller ID (by overriding CLIR) either through a paid service or a special SIM card (read below). If you happen to have such a service enabled in some devices, you can set-up call-forwarding on a victim’s phone by yourself, avoiding use of 3rd party services like TrapCall entirely. Unfortunately, we haven’t tested any of these services first hand and cannot give any review / opinion whether they are truly effective. How To Find Out Secret / Hidden / Withheld / Unknown / Private Number with SOCLIP SIM Cards or Service? 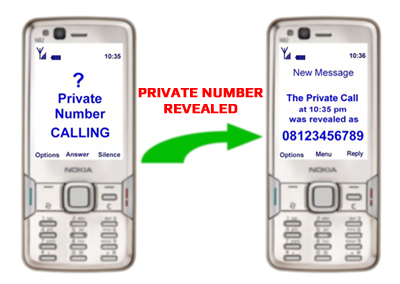 Some providers offer special SIM cards with unlocked feature of identifying private / unknown / hidden / withheld numbers. Those SIM Cards are usually reserved for special individuals, VIP persons, and, in general, everyone who is willing to pay a hefty price for a premium product. Again, this depends on your country, location, local laws and telecom operator policy. Additionally, some providers, in accordance with local regulations, offer extra service for overriding hidden Caller IDs through a special activation sequence code and one-time or a monthly fee. 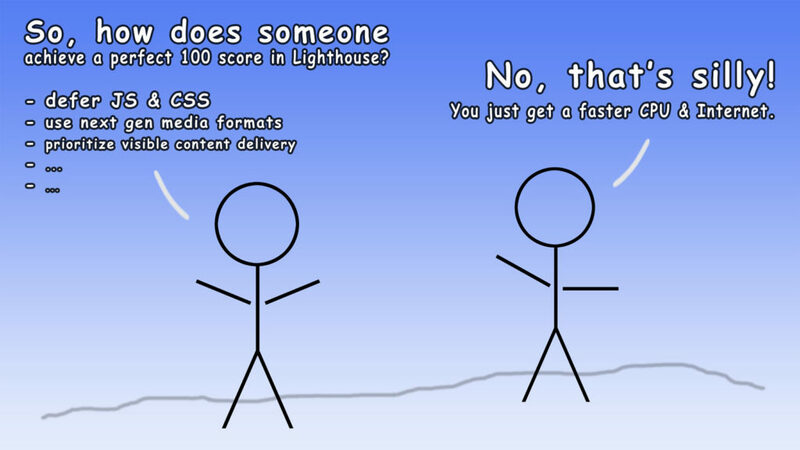 This service is not available everywhere, though. How To Stop Private / Unknown Numbers Calls? There are many apps on the market (Android & iOS) that can provide this functionality for you, if your phone does not already have it in Calls settings (depends on the operating system & version, you may not require any external app in order to reject unidentified calls). In some cases you will have to install a 3rd party app and grant it permission to access your main Phone app. 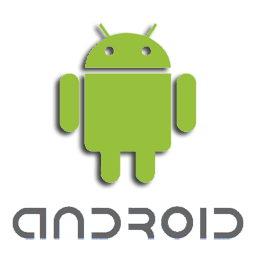 There are many apps available, some funded through ads, others completely free & simple to use. Nothing wrong with that – just bring me back my peace of mind! 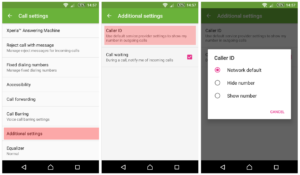 Simply install the app from PlayStore/AppStore and set the app to automatically reject hidden caller ID (private / withheld / unknown) calls and you’ll be done with it. However, in some phone models your phone may ring for a split of a second before the app kicks-in and block the caller / further ringing. We are not sure why this happens, it is definitely not related to the blocking apps (as every single one we’ve tested behaved the same way in certain phones / brands / models). So, the only solution is to record a custom ring tone with a small silence / gap at the start of an audio file (0.5 ~ 1.0 seconds should do the trick), to give it some time for the blocking app to kick-in and prevent further ringing. 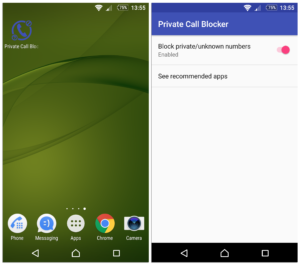 ⏭️ NEXT: How To Block/Stop/Mute/Hide Android System Apps Notifications?